Some people say that when you’re buying a luxury watch, spending four times your monthly salary is the proper route to take. Do you agree, or would you prefer a cheaper alternative? 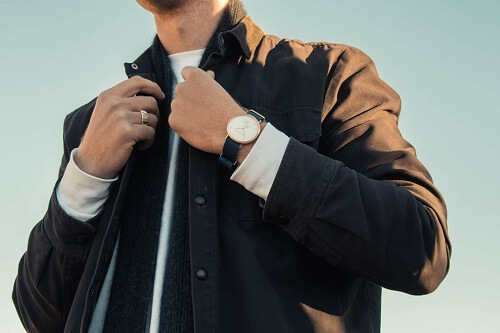 Whether you’re looking to sport a luxury watch or have a favorite type of watch that’s a little cheaper than a luxury brand, you’ll need to you about watch sizes. Having to wear a watch that’s sized incorrectly is an undeniably frustrating experience. Avoid all the hassle, and get it done right the first time. All watch sizes are not created equal. It’s a little more complicated than small, medium, and large, so you’ll need to take your time to measure out your wrist and get the details just right. This is a fancy way of saying the measurement around your wrist. Think about putting your thumb and forefinger around your wrist. This is the watch case diameter. This is the most important element of choosing your wristwatch, because it affects your comfort the most prominently. The normal size for men’s watches ranges from 38mm to 46mm. If it’s anywhere below 38mm, you’re typically going to be looking at women’s sizes for your watch. Measure your wrist. You can use a paper tape measure to take this measurement. If you don’t have one handy, you can use a dollar bill to figure out your measurement. They’re six inches long, so you can adjust it to determine the size of your wrist. You can also get your wrist measured at a store or look more into how to measure your wrist. If your wrist is in the six to seven-inch range, your wrist is about a small to a medium in size, and you can use this as a reference for looking at your watches. Small to medium diameters measure 38mm, 40mm, and 42mm. If your wrist circumference is 7.5 to eight inches in size, you will be a large size. These sizes are usually in the 44mm to 46mm range. If for whatever reason you decide you want to skip all other steps with watch sizing, don’t skip this one. It’s pivotal for getting a watch that is comfortable for you. As a rule of thumb, a watch that’s proportioned well usually has a watch band that measures to be about half the size of the case diameter. That means if the watch you’re wearing is a small, 38mm, you’re going to look for a watch band width of 19mm. This rule isn’t set in stone, however. If you have large wrists you might think that large bands look better, or if your wrists are smaller you might like an even smaller watch band. You might just like the style of a wristband that’s slightly thicker or slightly smaller. Don’t be afraid to go for it even if you break the rules. The half-size rule is just a guideline for what’s typically considered a classic, well-fitting watch style. Your watch case is your literal watch face. The thickness is the size that it measures in width on the sides. Proper case thickness is often associated with the diameter of the case itself. When watch technology was still developing, it was thought that the thinner a case was, the higher the quality. With quartz watches and electronic watches hitting the market, this is no longer always the case. Now, it’s thought that as the thickness of the case decreases or increases, then the diameter of the case should decrease or increase as well. For watches that measure 38mm to 42mm, you’ll typically see about 7mm of thickness in diameter. For watches that measure in the large size, above 44mm, you’ll typically see the thickness get up to 9mm. The case thickness will usually be in proportion to the watch that you’re buying. It will also be proportionate to your body and your wrist. If you’re simply looking at your wrist and the watch doesn’t look right, then that’s a clear sign that you need to consider getting a different watch size. Top watches will look good on your wrist, not mismatched. The lug size, pusher, and changer can affect the size of your watch and how it looks on your wrist. Those are the little buttons that are on the side of your watch face that you use to set the time. If they’re big or bulky, they can increase the look of the size on your wrist. Don’t forget to pay attention to the watch hands as well. Bigger or larger watch hands can make your watch look bigger or larger. The same goes for the numbers on the watch. They should match up with the size of the watch hands and look proportionate overall. If you want to browse mens watches and don’t want to waste your time trying to find a place that has all quality selections for you, then browse Watch Shopping. You’ll never run out of options, and will be sure to find that watch you’ve always been looking for. Now that you understand how watch sizes work, it’s all a matter of time until you get your next new watch. If you do it right, getting a new watch is an investment. You want to be sure you’re getting the style you want at the right price, all while making sure that the watch you’ve chosen is top quality. That means you’re going to have to do some research. Luckily, time is on your side, and so is The Watch Blog. They have all of the in-depth reviews that you need to make your decision. You wouldn’t purchase a car without doing your research first. You probably didn’t even buy your toaster without doing some comparison. Why should it be any different for watches? Get out there and get that watch that you’ve been dreaming about. Especially now that you’ve got your watch size down pat, you’ll keep it until the end of time.